We have our Amish and Mennonite Women doing a lot of Quilting - Now we can offer custom quilting for your special quilt needs. 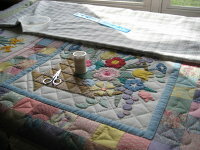 Have you been looking around for a specific quilt and not been able to locate it, then let us make that quilt for you. It is easy! 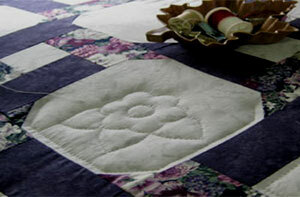 Are you looking to have a Custom Amish Quilt made to your specifications? 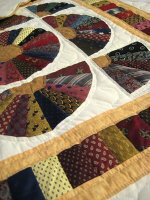 Are you looking to have your New Quilt quilted by an Amish Quilter? Do you have a Quilt Top? Do you have an idea of the pattern you would like? Have you been thinking of having a Memory Quilt made? If the answer to any of these questions is yes, then we can help. Our Amish ladies are ready to help make that dream come true. 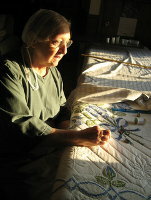 Click here to meet some of our Amish Quilters. Call us to discuss your quilt. Have ready the following information: Quilt Size, Color Theme, Pattern (or you will supply the top), Special Details (like scalloped edging), Time frame you are looking for. If you have a picture of a quilt you like, then email that to us. Once we get your details, then we can contact our Amish Women Quilters and get back to you with a time frame and estimated cost. 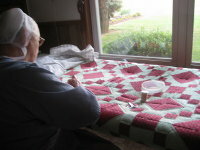 For a rough idea of how long it will take - Depending on the time of year, quilt size and special quilt needs - we have been able to get a quilt done from start to finish in 4-9 months depending on the season of the year we start on the quilt. 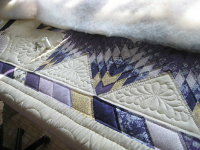 All Custom Amish Quilts come with a Level One Certification (click here for more info) stating the name of the quilter. They also, when possible, come with a photo of your quilt in the quilting frame being hand quilted in the home of our Amish or Mennonite quilter. So give us a call, (see the number below). 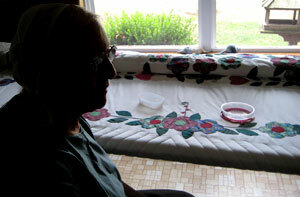 Ask for Patty and have a happy and exciting time creating your new Custom Amish Quilt. Here is a Price / Timeline chart to give you a general idea of what the cost will be for your custom quilting project. 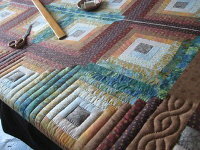 Using your finished Quilt Top – We Hand Quilt it, supply the backing fabric, the poly batting and the binding. 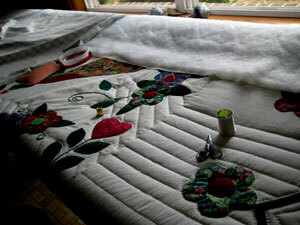 *Timeline is an approximate guess, it all depends on the time of the year and the availability of the quilters. 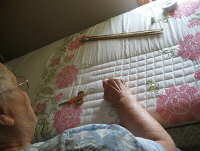 It is not unusual for us to have a quilt done in less time than stated.